The CPTZ concealed post base provides a clean, concealed look while providing a 1" standoff height above concrete. The 1" standoff reduces the potential for decay at the post end and satisfies code requirements for posts that are exposed to weather, water splash or in basements. It is part of a system of concealed connectors that includes the CBTZ and CJT. The CPTZ is tested and load rated for uplift, download and lateral load. Simpson Strong-Tie saves installers time by providing all the necessary components to make the post connection in one box (anchors not included). There are two anchorage solutions available. See tables for information. Solutions have been calculated per ACI 318 to determine their allowable load in different concrete configurations. Knife plate, washers and standoff base are ZMAX®-galvanized steel. The standoff base has an additional textured, flat black powder-coat finish for aesthetic purposes. The 1/2"-diameter drift dowels are mechanically galvanized in accordance with ASTM B695, Class 55. If substituting 1/2"-diameter bolts, a hot-dip galvanized finish is recommended. Some available in stainless steel (see table). Use knife blade portion of CPTZ as a template to mark dowel/bolt locations on post. Drill 1/2"-diameter holes perpendicular to post at marked locations. Cut a 3/16"-wide slot in the end of the post. Cut slot on face adjacent to the one with the holes. If using a circular saw, cut the slot roughly 6 1/2" up the post. Test that the knife blade slides freely in the slot. Install the knife blade portion of the connector on the anchor bolts and then place the supplied washers over top of the connector’s tabs and on the anchor bolt. Use nuts to attach the knife blade and washers to the anchors. The Designer must specify anchor bolt type, length and embedment. Slide the standoff base on to the knife blade assembly. Stand the post on the knife blade and drive in the dowels supplied with the connector. CPTZ concealed post ties are supplied with (3) 1/2"-diameter dowel pins. Alternative 1/2"-diameter hex- or square-head machine bolts may be used for loads listed. Allowable uplift loads are calculated per ACI 318-14 with reference to cracked and uncracked concrete and are qualified for Wind and Seismic Design Categories A&B. Allowable loads are also applicable to detached one- and two-family dwellings in SDC C per IBC, Section 1613. No further increases allowed. Edge distance is considered to be measured from the center line of the nearest anchor bolt to the edge of concrete. Foundation dimensions are for anchorage only. Foundation design (size and reinforcement) by Designer. The registered design professional may specify alternative embedment, footing size, and anchor bolt. Lateral loads (F1 = F2) for Corner — Flush Edge conditions are CPT44Z = 395 lb., CPT66Z = 570 lb., and CPT88Z = 740 lb. 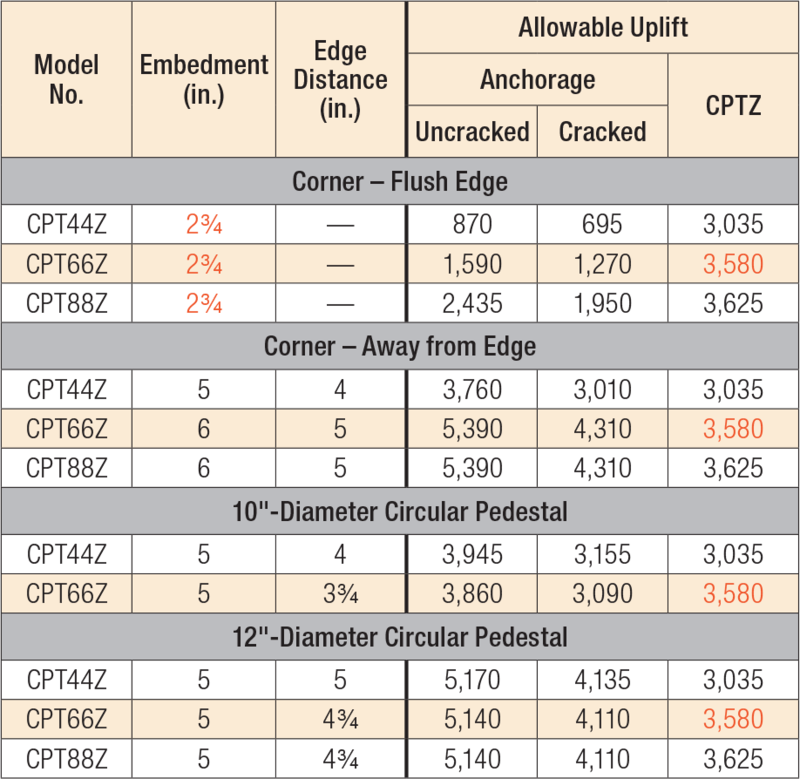 For all other installations using CPTZ with SET-3G or SET-XP® anchoring adhesive, use the allowable loads from the CPTZ table above. 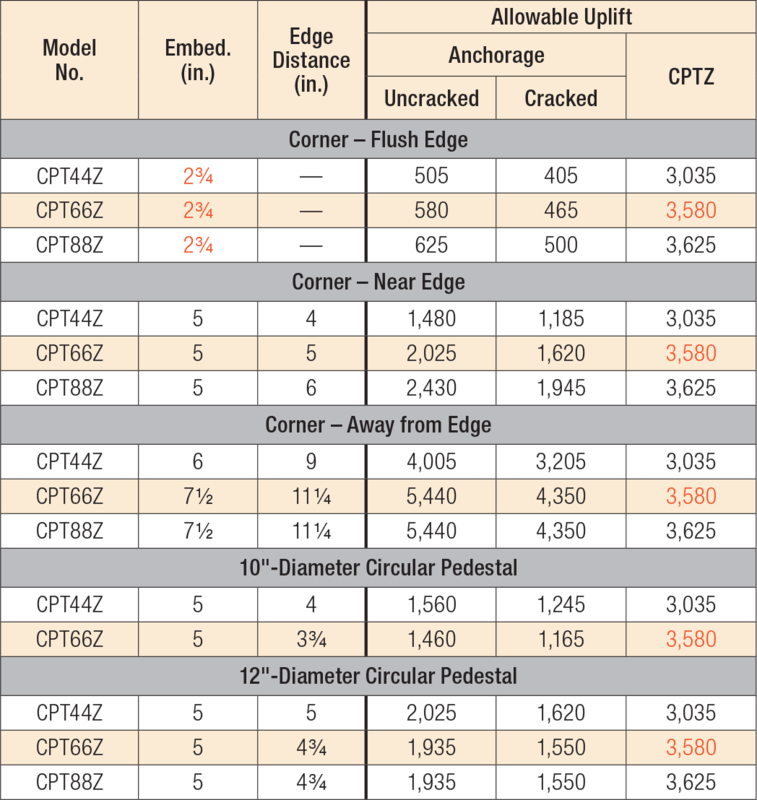 Edge distance is considered to be measured from the center line of the nearest anchor bolt to the edge of concrete..
Tabulated anchor embedments will also achieve the maximum lateral loads from the CPTZ table above. CPTZ See specific model numbers for code listings.